Hey guys!! Have you ever gotten in the mood to get in the kitchen and create something amazing? I mean like, AH-MAZING? You know it is out of your culinary knowledge and you think your ability but you decide to go for it anyway? Well that is what I did with this cake. I wanted to make my husband his dream cake, just because he is, ya know, so DREAMY!! I took to YouTube for some ideas, and found only one cake that I thought to myself would be something I could experiment with. More the method, than the actual flavors and colors. My Geo, is a peanut butter and chocolate loving man! I have been spending so much time away I just wanted make him something special. I mean after all, food is love, right? I wanted to make this so far over the top it was almost ridiculous. There is some explaining to do, so let me get to it. This is NOT hard, not even a little, but there are some specific things you need to do! OH! Did I mention this cake has a surprise in the middle?!?! Preheat your oven and prepare cake mixes per box directions. Line cake pans with parchment and spray with non stick spray. Divide the batter so that about 1/4 goes in each round cake pan and 1/2 goes into the angel food cake pan. The round layers will go on the top and bottom of the angel food cake and don't need to be the normal thickness. Once this is done, bake according to the box directions. A few minutes less for the round cakes and up to 15-20 min longer for the angel food cake because it is obviously thicker. When they can be poked with a toothpick that comes out clean, they are done. Let cool COMPLETELY!! 1-1 1/2 cups mini Reese's Peanut Butter Cups or Regular size cut into quarters. In a bowl with a hand mixer or in a stand mixer combine 2 cups peanut butter, butter, confectioners sugar, and vanilla. Beat until smooth. Begin adding milk until you achieve the desired consistency for your liking. Beat for 2 minutes on high when you have achieved that consistency and set aside. When cakes have cooled, on a cake plate or cake board, place your 9 inch cake. 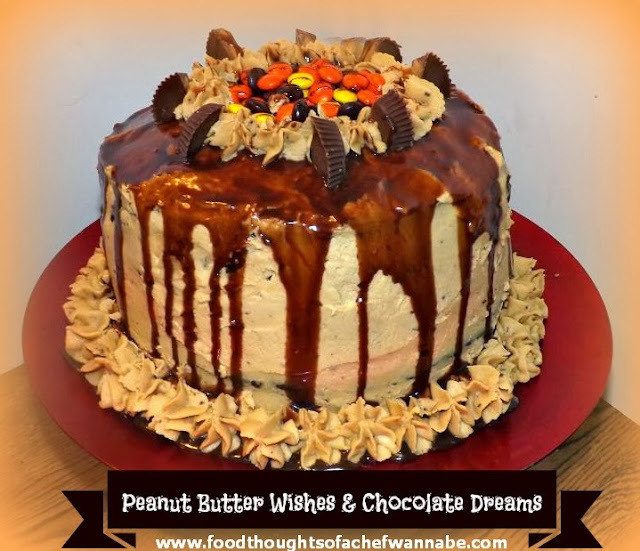 Spread a thin layer of plain peanut butter on top. Now, add your angel food cake pan layer, largest side down so it is evenly placed on top of the 9 inch layer. Spread a layer of peanut butter on top. Frost the entire cake with your frosting. Make sure you have enough left to do any decorating with a piping bag that you want to do. I also poured ganache over the top of my cake for added decoration and interest. Here is my recipe for Ganache. Complete joy and love in every bite!! I have an aversion to jello. I don't know why. Oh wait, yes I do, it is the texture. That slimy, wiggly, jiggly, gelatinous goo, kind of consistency. There is something jello reminds me of, especially grape or red or any variance of the two, but I am going to spare you the mental image. You are welcome. However, I have this inner battle when it comes to jello shots. I mean HELLO, isn't it obvious? I also have an aversion to worms. Slimy, nasty, dirty, wiggly, bleh. I have "chicken skin" just thinking about them. Oh, that is what I call "goosebumps" As a matter of fact, I got out of the shower this morning, then took the dogs out, and stepped on one, enough to feel it wiggle between my toes, I screamed, called the dogs in, and re showered. I can STILL feel that wiggling between my toes. And the smell of worms. GAH! This is from a self admitted "indoor girl". The first jello shots I ever had, were amazing. Since then I have experimented with so many combinations of flavors. Things like rum with lime jello, strawberry jello and whipped vodka, the possibilities are endless. Let's face it, who doesn't love a jello shot? Who doesn't double take at the thought of partaking, especially when they look like real, slimy, jiggly worms?!?! Prepare your straws by pulling all of the bendy parts out. You want them to mark the jello so it looks segmented like a real worm. Rubber band them together and with the bendy part closest to the bottom, place in a glass or tall container as small around as possible to make your straws fit as snug as possible. Set aside. In a large glass measuring cup or medium bowl, combine boiling water and jello, mix until the jello is completely dissolved. Add in alcohol, food coloring, flavoring, and mix. Pour mixture over the straws until there is about 1 inch in the bottom of the glass. Freeze for 20-30 minutes until set. This will prevent all of the jello in its liquid form from running out the straws and just filling the glass when you add it all. Make sure your gelatin has cooled, if it is hot, it will melt the "seal" you have made on the bottom!! Now pour the rest of the jello over the straws and refrigerate at least 4 hours to set. When you go to remove the "worms" just run the straw under warm water for about 2-3 seconds. Dry it off with a towel and pinch the end and push the worm out! Wa-laaa! GROSS!! If you end up with someone else's costume, or are hurling vodka worms, don't blame me. Take 2 aspirin and call me in the morning. PS. This would be a fun project with kids in general. OMITTING the alcohol obviously. 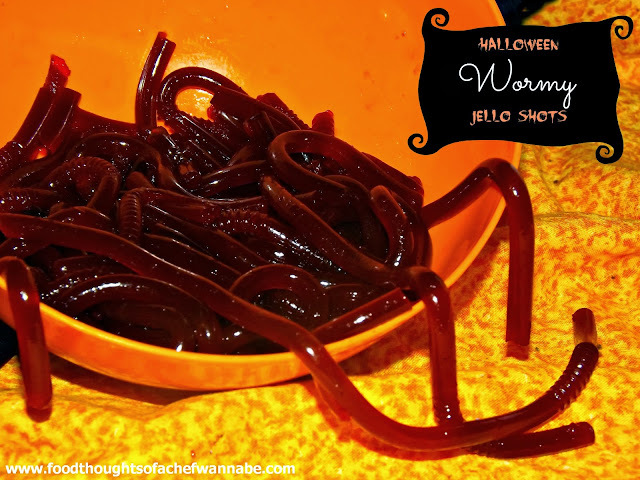 Worms aren't just for Halloween! Salted Caramel Apple Cinnamon Rolls Smackdown! Jenn made my Not Your Mom's Cinnamon Rolls, and loved them but was looking for a substitute for the milk for her child's health issues. I suggested apple juice. Hmm, now THAT put an idea in my head and I told her about it. She said she was considering playing around with that idea as well and we both decided to make our own version! 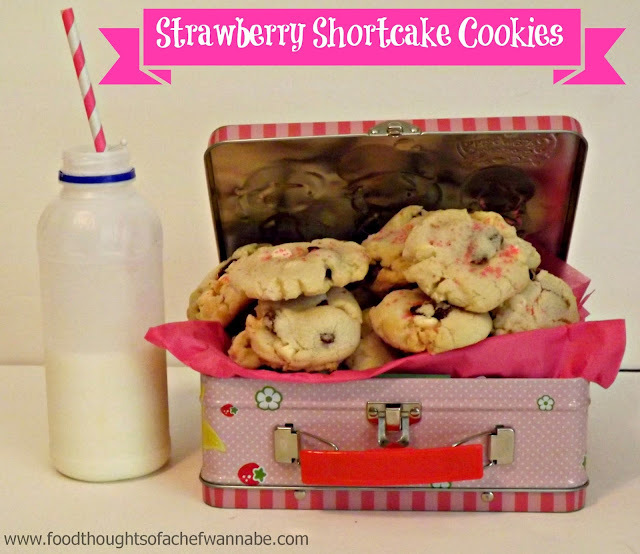 I am going to share her recipe at the bottom and I already see something I am going to incorporate into MY recipe! Thanks Jenn, it was fun!! I have to make hers and she is going to make mine, we will get to that at some point! As it turns out, we both did nearly the same thing without knowing it! My husband thought of my twist, so let me thank him for that, because I know he is reading and after all, it was HIS idea! These are to die for. No, I know I say that a lot, I mean DUH, what I am a supposed to say? My food blows?! HA! 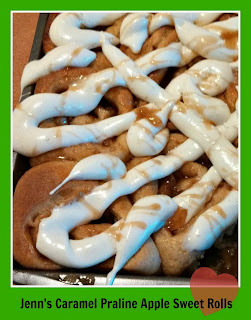 You will be following my recipe for the above mentioned cinnamon rolls, and we are going to add a twist. Are you ready? I am! In a measuring cup place hot water and 1 tsp sugar. Put a thermometer in it and if it is to hot, wait for it to cool to 110-115 degrees. I know some people say they always kill the yeast so better to have it to hot and have to wait for it to cool a bit. I do it like this and just wait for it to get to the temp I want! When it gets to the correct temperature add in your packet of yeast, give it a tiny stir and remove thermometer. Let sit 3-4 minutes. It should get foamy on the top! Now in a bowl or stand mixer (using your dough hook) add in the egg, milk, melted butter, sugar and salt. Mix until combined. Now add in the yeast mixture, flour, cinnamon, and vanilla. I might have slipped and added extra vanilla too! I always do, you know that! HA! Spread the butter over the dough, make sure to get it covered everywhere! Sprinkle brown sugar evenly, then spread the apple pie filling on top, and then the cinnamon. Starting at the bottom start rolling the dough, go from the bottom and work your way across so it is eventually all rolled up. When you get to the end, pinch the seam together. Now you could get up to about 14-16 out of this, but I get 12. I like tall, substantial rolls. So using a serrated knife, gently cut it in half and then go from there. However many you want out of the roll, make it happen! If you cut them thinner and get 14-16, make sure to take 5 minutes or so off of your bake time! When they are cut, put them into a generously buttered 9x13 pan. I fit 12 perfectly. Get them situated and then cover them with a clean dish towel and let raise again, for approximately 1 hr. If you have your oven on, and use my trick, it won't take that long. Bake for 30 minutes. Remove them from the oven and let cool for 15 minutes. After rolls have cooled, ice with cream cheese frosting. 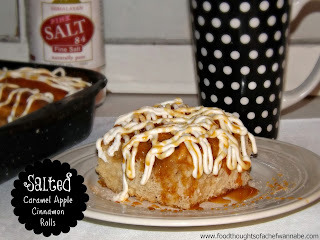 Drizzle liberally with caramel topping and give each roll a tiny sprinking of salt on top! Serve and lose yourself in the decadence!! These looks DIVINE and I am so glad you were able to change this up to meet dietary needs of you and your son!! 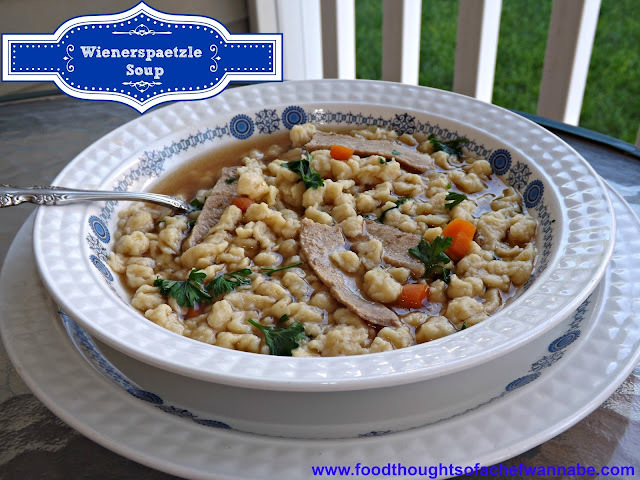 Thanks for inviting me to come up with this recipe with you!! In a microwave safe bowl, warm apple juice to 110⁰. Mix sugar into warmed juice, then add yeast and mix gently. Set juice/ yeast mix aside. In a large mixing bowl, mix 3 ½ cups flour, salt, eggs, vanilla and melted butter. Once the juice/yeast mix starts to get all foamy on top, add to flour mixture. Stir around until well incorporated. Add more flour, ½ cup at a time until a nice dough forms and starts to clean the sides. Turn out on to a smooth floured surface. Add in flour as need to make the dough not sticky, but don’t add more than needed. Knead dough until it becomes smooth and springy. Place dough in a lightly oiled bowl, cover and let rise for 1 ½ to 2 hours or until doubled in size. While dough is rising, make the apple filling. Place first 6 filling ingredients into a medium saucepan. Cook on medium high, stirring occasionally. Bring to a boil for 2 minutes, and then reduce heat to medium low. Cook for 20 minutes, or until apples are tender, stirring occasionally. Remove from heat. Drain apples, reserving the liquid. Let apples come to room temperature. Once dough has doubled, dump on to lightly floured smooth surface and roll to approximately 12” X 16” rectangle. The dough should be about 1/2” thick. Gently spread with softened butter. Sprinkle with brown sugar and cinnamon, then evenly spread the cooked apples. Carefully and tightly roll the long part of the dough and pinch the edges closed. Here I kind of smash and smush the dough log around to even it out and make sure it is the same length and thickness all along the roll, you want a nice even log. Then divide the log into the number of rolls you want. I cut 12 rolls, but I made them nice and thick. You could probably get 16+ with smaller rolls. Place all the cut rolls into the pan so the cinnamon/apple mixture is facing upwards. Cover and set aside while preparing the praline sauce. Bring first 4 ingredients to a boil, stirring constantly for 1 minute. Remove from heat and add vanilla. (It may splatter) Pour over resting rolls in pan. Recover pan and let rise for 1 hour. Place in preheated 350⁰ oven and cook for 25-30 minutes or until lightly browned. When rolls are removed from oven to cool, start making the frosting. Beat cream cheese and butter on medium until smooth and creamy. Add in remaining ingredients and mix until smooth. 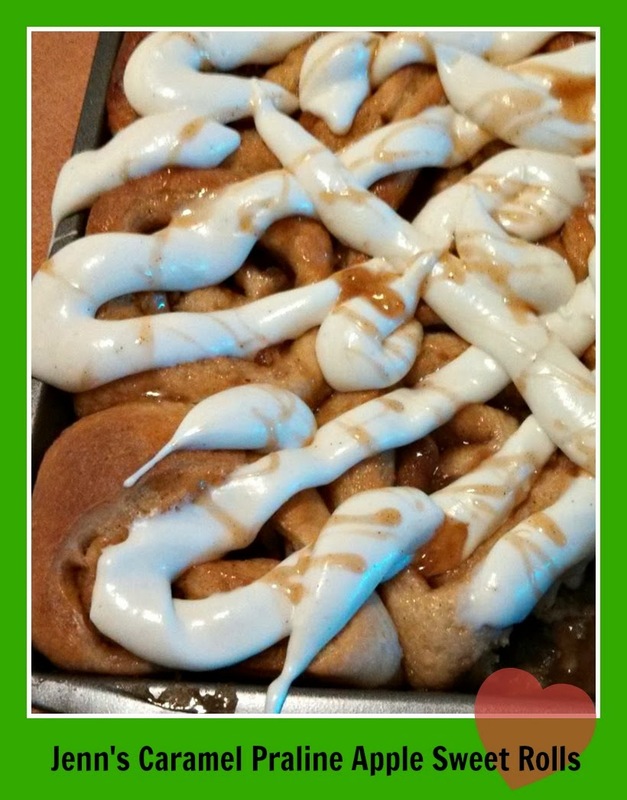 Once cinnamon rolls have cooled to warm, spread or pipe frosting evenly over them and serve. My dad. For as long as I can remember, my dad has been the backbone of our family. The quiet, hard working, do what has to be done, kind of backbone. He never needed praise, he only wanted to provide for his children, and be paid with hugs and kisses. Sometimes, my dad, who signed himself into the military at 16, to ease the burden of mouths to feed for his parents, worked 4 or 5 jobs at once. No, I am not kidding. Ask him if he would ever change it. He would tell you no. Then he would tell you he would only change being able to spend more time with us. When he would come home for dinner, after he would eat, his one luxury was watching MASH. While he watched MASH however, I was sitting on the sofa behind him, putting curlers in his hair, barrettes, ribbons, maybe even some makeup. Whatever it took to make us happy, he did. He has never been afraid of hard work, he taught us all to be the same. He loves us with passion, and he disciplined with passion. 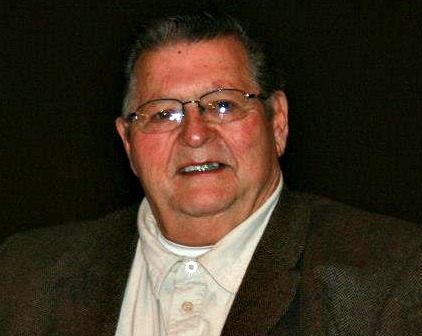 He always made it clear he wasn't there to be our friend, he was our dad, and that was that! Remember the days of having so much respect for your parents, you would never do anything wrong, just for fear of making THEM look bad or disappointing them?? Thanks dad, for everything, but mostly for being our dad. I love you! I have been spending a lot of time at my parents the last few months. We had a conversation one night about all the things my mom used to cook that my dad hated. He never said anything of course because, he ate what there was to eat. My mom used to make biscuits with everything. Recently he told her how much hated them, and always did! However, she made this one thing for him that I hated! I think a lot of my siblings disliked it as well, can't really remember. We were having a bit of a celebration while I was there last week, and so I surprised him and made him his favorite pancakes. He told me his mother used to make these for him as well. I have never seen anyone eat it besides him, EVER in my life. I guess you kind of get a "twofer" with this one. 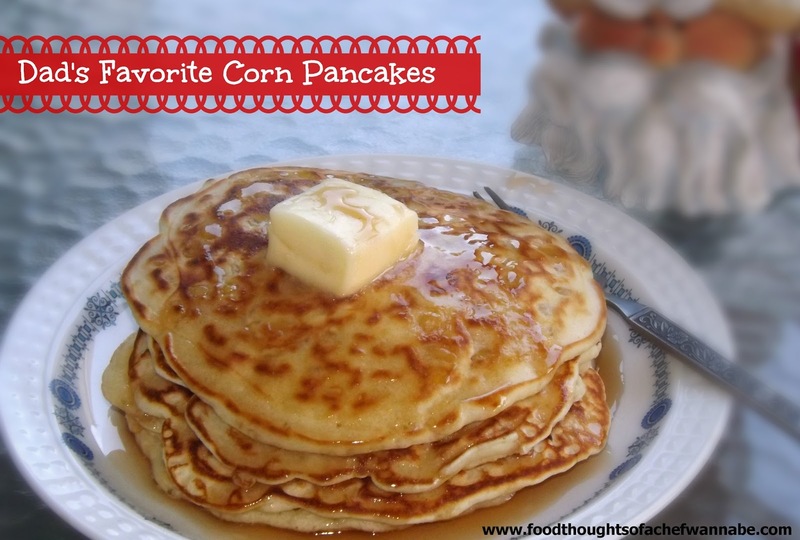 Omit the corn and you have the best pancake recipe ever! I have NEVER been able to make pancakes, until this recipe I found at my moms. Not only were they perfect the taste was incredible. I used only half of the batter for corn pancakes, and put vanilla in the other half and made regular for myself. O. M. G.
Give my dads a favorite a try, tell me what you think! I know how it sounds, but, hey, anything for dad! Combine all ingredients until smooth. Make sure to use nonstick spray or butter in your pan or on your griddle. Using a 1/3 cup measure, make your pancakes on medium heat. When they start to bubble they are ready to flip and the second side just takes about 30 seconds! Serve with butter and syrup!! 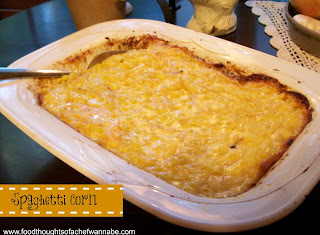 If you omit the corn and add, 1 tbsp. vanilla, you will have AMAZING pancakes! The batter should be a bit runny, that is the secret is to light and fluffy pancakes! I hope you enjoy these! We used to have them for dinner, fairly often. Likely because they were cheap for a family 10-12 to make! We were also, a big breakfast for dinner family! I live in the Cornhusker State. I moved away, and returned in recent years, and it is still a state where the word "corn" must be the most used word among its residents. Cornhuskers, (though we won't discuss them right now), cornfields, corn trucks, corn pickers, popcorn, corncorncorncorncorn! It was only natural, in light of it being football season, that I made a game day snack that contained corn, right? You know, you make all that game food and just make an entire, day long meal out of them? Do you all do that too? We are a picky loving' family, we just would rather "picky" to the Philadelphia Eagles! Yes I admitted it, a Nebraskan who isn't a huge Husker fan. You all know I am going to have to into hiding now, right? Anyway, this is a fairly healthy dish for me. I mean, this is no diet blog for sure, but I also love healthy things too! Yes I DO! Mind you, I ate this salsa between the beans. I don't groove on beans, not even in this salsa. The flavor is great, and though I did not use cilantro, I think it might be a tasty addition if you groove on it. Such a split world when it comes to cilantro eaters and cilantro free'ers! How do you exactly spell that, really? I like my way, so it is staying. 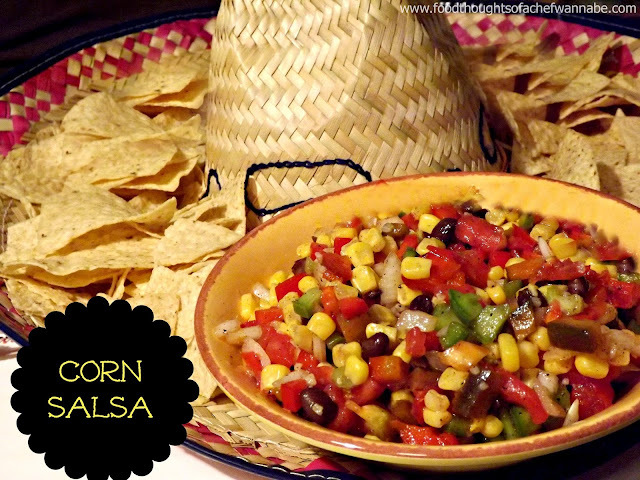 Enjoy this for game day, your next FIESTA, or just for healthy snacking anytime! This makes a fairly large batch. OK, it makes a huge batch. Combine all ingredients. Cover and refrigerate at least 1 hour before serving. The longer it sits, the better. Stir occasionally if you like while it is chilling! Serve with chips and you have a TOUCHDOWN! Let me introduce you to a childhood favorite! However, I have a love hate relationship with the MEMORIES these little sweet treats bring up! Growing up Catholic, but not attending a Catholic school, we had to attend CCD every Wednesday after school. I swear at 3..err 29, I still get butterflies on Wednesdays! I would get off the school bus at the high school, and walk to St. Mary's Catholic School, a school in fact where I would later teach music! Anyway, Sr. Michaeline was my teacher for several years. (oh yea me) Our parents had to take turns sending treats. 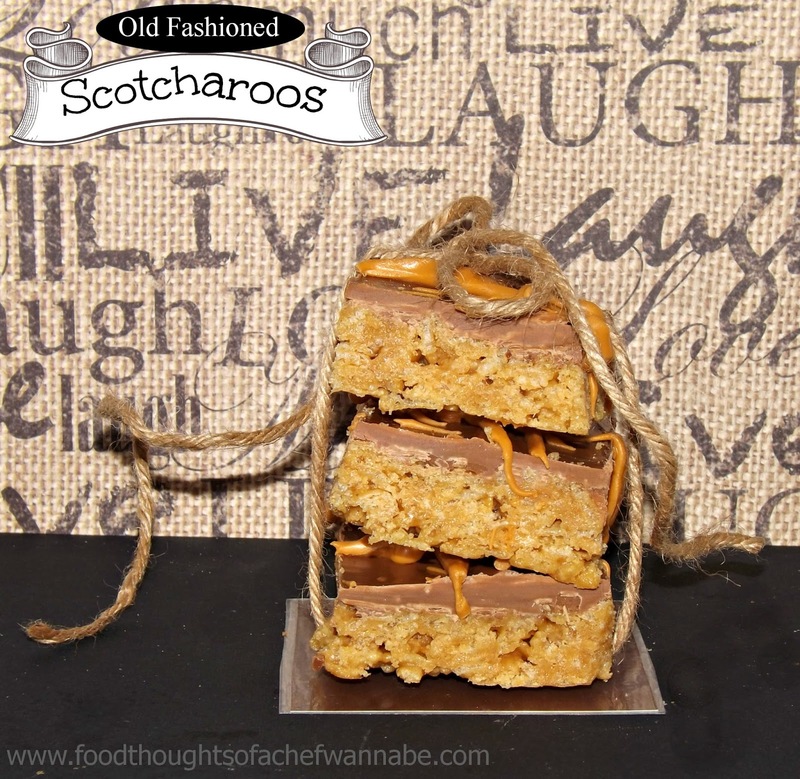 I always asked my mom to make scotcharoos. Well, the LAST time I ever took them, in the 3rd grade, I was SO excited. My mom had let me cut different shapes with cookie cutters. I had decided exactly what shape each classmate would get. I got to CCD, and the helper was there and told me to go ahead and hand each friend the ones I made for them. She said I could "show everyone what shape they were getting". So as I proudly trotted around that classroom the STAR shaped one changed my life forever. I had a complete Mary Catherine Gallagher moment. I proudly held it in the air, and as I put it down, Sister Michaeline walked in and gave me the look of DEATH. I got nervous because she was not a nice woman by far and I was afraid the giggles and fun would upset her. I went to put it down and knocked over the cup of red koolaid over with one of the points of the star. Uh-huh. Did I mention it was the last time I took them? She handed the rest out to who she wanted to have them and made me stand in front of the class and tell them I was clumsy and made them all stand in a circle around me while I scrubbed it off the floor. Nice lady, eh? Do you need a tissue?!?! HA HA!! I have one thing to say to Sister Michaeline..........BLESS YOU. So now, I share with you, one of my very favorite childhood treats, complete with that "Catholic School" smell! Oh yea, if you thought for a minute these are healthy, click off now. In fact if you are diabetic, take your meds before you even read. K? K.
Combine syrup and sugar in a saucepan. Cook over medium heat stirring constantly until it boils. Remove from heat and stir in peanut butter. Add rice krispies when it is all combined. Pour into a buttered 9x13 pan and press into the pan evenly and firmly. Melt in the microwave, 30 seconds at a time. When all chips are melted and you have stirred to combine completely spread over the top of the scotcharoos evenly. Refrigerate until the topping is hardened! Cut into squares, or any shape, EXCEPT stars! 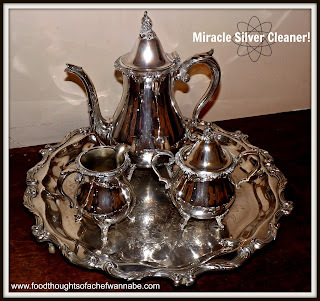 How to Clean Your Silver. Amazingly effective and easy! So as most you know I have been spending a lot of time with my parents. The last time I was there, my mom and I cleaned out her buffet. We came across her almost completely black silver tea service. She expressed that she might take it somewhere to have it professionally cleaned and put it back out because she loves it. I laughed at the thought of the poor sucker who had to manage to clean that things up. Next time I am there, I am going to do this again, just to make sure things are really clean. This was incredible and though it isn't food, it qualifies as the "and my life" part! My mom almost DIED when she saw it. She was sure I took it somewhere while she was gone. Perfect 10 strikes again! Here is how this works. They say you can put it right in boiling water, but 2 of my pieces were to big so you can do it how I did it, or do it all in the pot of boiling water if your silver pieces fit. Clean your sink well. In the bottom of the sink, lay a piece of aluminum foil, shiny side UP. Please your pieces on top of it. (when I did the tray I put the foil shiny side down on top so it was in contact with the area needing cleaned) Get it? In a LARGE pot, boil water. Boil enough to cover what you are doing as best you can. Add in 1 tbsp. baking soda, and 1 tbsp. salt. Pour it over the pieces and let sit for 5 minutes. (less if less tarnished). drain the water or lift it out of the water and with a soft rag start rubbing it. You barely need to rub it at all. In fact, I put that tray under hot running water and the black just rinsed away! It was SO cool! If your pieces are small enough, lay the bottom of your pot with foil, add water, baking soda and salt and bring to a boil, slide in your smaller pieces, turn off the burner and wait. Remove and wipe clean. I hope this is helpful for anyone who needs silver cleaned. It is an ehow.com recipe, I just wanted to share it, as being completely effective and almost miraculous!!! Yes, you TO can have wedding cake without having to get dressed up, get a wife, get a husband, pay for an open bar, or an expensive dress! Everyone (OK most people I know) are wedding cake fanatics. I asked you all on Facebook what flavor immediately came to your mind when I said, "wedding cake". You had lots of cool responses for sure! 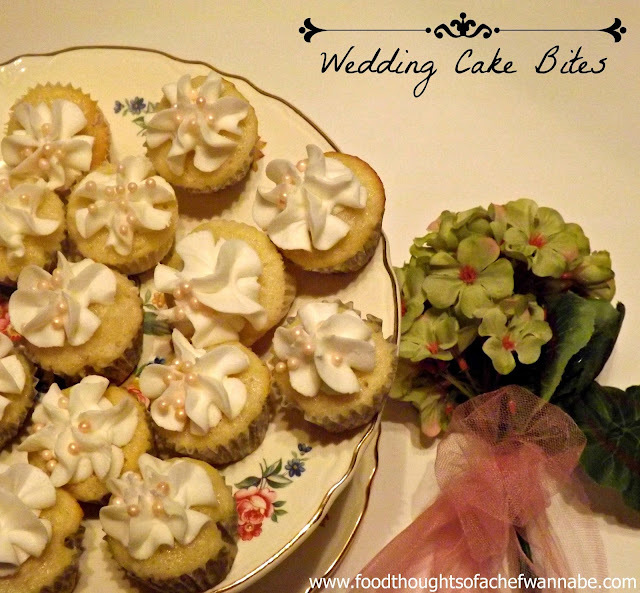 When I think of wedding cake I think of white cake, with almond flavor. Pretty old school eh? But for some reason that is what comes to me first. I made mini cupcakes, thus, ya know, the "bite" part. You are welcome to make regular size cupcakes. This recipe yields approx. 5-6 dozen mini cupcakes. Preheat your oven to 350 degrees F. In a small bowl combine, flour, baking soda, and salt. Set aside. In a larger bowl or the bowl of your stand mixer combine, shortening, eggs, sugar, almond extract and milk. Mix until completely combined. Add in flour mixture and mix just until flour is incorporated. Line a mini cupcake pan and fill 3/4 of the way full. bake 13-15 minutes. Cool for 10 minutes and remove from pan. Combine all ingredients until smooth and creamy! Ice your cupcakes by piping or spreading on with a knife. Garnish with sprinkles or colored sugar or leave plain! I hope you love these as much as we do! It makes a ton, so be prepared to share! I know I have been throwing "T-fal" around like crazy lately, but it is with good reason. I was sent a beautiful 12 piece set with "Thermo-Spot". What that means is, in middle of the sauté pans, is a red dot with writing and circles. When your pan is at the optimum temperature and ready for your ingredients it turns completely solid red. I love this for sautéing, nobody wants their veggies sitting in oil so long they won't brown up or sauté nicely. Another thing I love about the sauté` pans are of course they are nonstick and the handles don't get hot. All of the pots in the set are oven safe to 450 degrees F. I tested it and they did beautifully. Just REMEMBER, the handles are HOT when you get them out of the oven. I know, it might be obvious to you, but if you are in a hurry and you just are thinking, "oh, they don't get hot" and BAM, you need a skin graft. Know what I mean? My Spaghetti Frittata, fresh from the oven in my T-fal 10.5 inch Sauté Pan! There is another HUGE perk to these pots and pans, and that is, they are marked with measurements on the inside! WOOHOO! Seriously, no more measuring or guessing. It is right on the pot, and easy to fill your pots to the desired measurement. I also appreciate the glass lids. I have the attention span of worm and I love watching my food cook. I also tested this in the dishwasher. I am leary of ever putting my cookware (and knives) in the dishwasher. I sucked it up and went for it, for the sake of testing every claim these pots have. It turned out just fine. I have to say, I won't do it on a regular basis, I just can't, I CAN'T but, in a hurried moment I will know they are going to be just fine. When you hand wash the nonstick pans, the food just slides out. It makes me all tingly. Even the nonstick clean easily. This set retails for an average of about 100.00 depending on where you buy it. I not only think it is a quality product for the price, I think if you don't get your hands on it, you are nuts! Oh and by the way, mine have black handles, some have red. I am not sure what you will get if you win the giveaway. Now for the part you have been waiting for!!! I get to give away one set to one of you! ACCKK!! 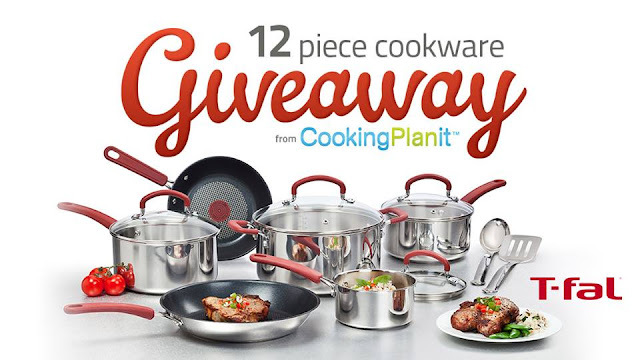 You are REQUIRED to have signed up for a free profile at Cookingplanit. Your membership will be verified. So don't forget or you can't win! You can STILL enter the remaining giveaways! Hurry!!! Check them out here! Yes, I DID say 4 ingredient. This is going to be every busy parents dream dish. Ok, well "dream dish" might be a little dramatic but it will satisfy your hungriest little monsters...er...children. I worked at a daycare in high school. 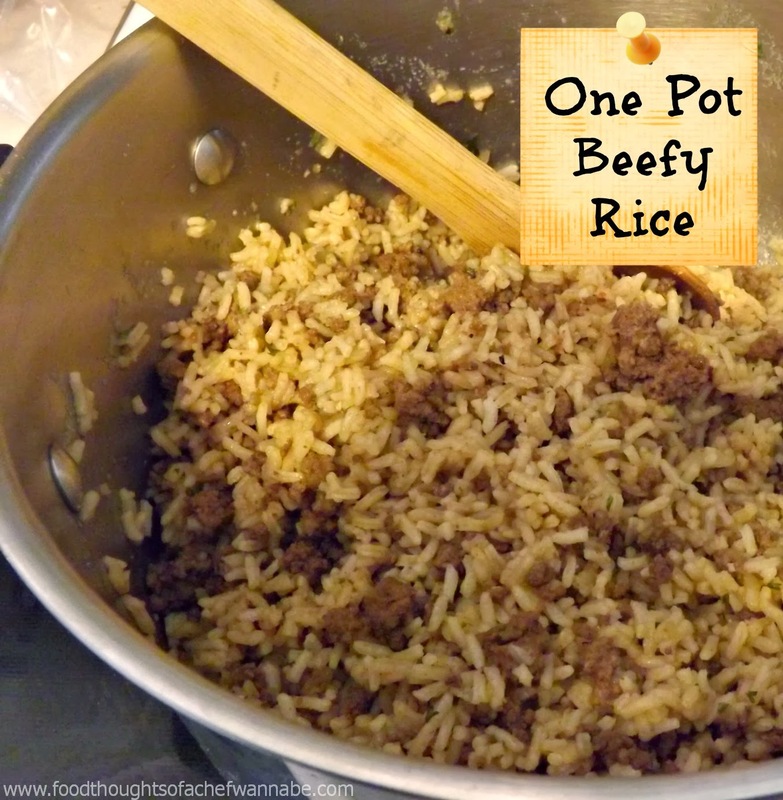 We used to make this a lot, but we just added ground beef to a pre boxed rice mix. I loved it. It was sodium laden goodness. However in my older and wiser years, I dropped the box mix and did it all with my own ingredients, ok MOSTLY. You simply do everything in one pot. You can add other things you like, onions, carrots, celery garlic, any veggies you want really, maybe even diced tomatoes. However, today I am sharing it in its simplest form which is my favorite. If you do veggies, just cook them with the hamburger as you brown it! I hope you give it a try. It is a great meal for picky eaters I find. If you have all the ingredients on hand you can have supper in 15 minutes. Dead serious, maybe even less. I do not count salt, pepper or seasonings as ingredients by the way, just in case you wondered! In a large pot, add in ground beef and any veggies you choose, IF you choose. Pepper and lightly salt the beef to taste. If you use a high fat content hamburger, drain the grease at this point, but do NOT rinse. If you use lean ground beef, just leave it. Add in the beef broth, onion soup mix, onion powder and parsley. Bring to a boil, add the rice, cover and remove from heat. Wait 5-7 minutes and fluff with a fork. Enjoy! Can you believe I have NEVER, in my life, ordered a "Banana Split"? Seriously! Never. As a kid, we all got the same thing, a small cone. Money was tight, and we would fight over any discrepancy so, my dad went ordered us small cones, across the board! There is a story in my family from before I was born. Apparently my dad and mom got all the kids an ice cream cone, which happened back then, about one time a summer. Remember I am the youngest, (aka Perfect 10) of 10 kids! When the kids in the back seat started arguing about someone having a taller cone, my dad pulled over, grabbed every single ice cream cone, INCLUDING my moms and threw them all out the window. Not a word was spoken, which for my dad, is worse than ANYTHING. My mom is still ticked off to this day!! HAHA! He wouldn't tolerate greediness of any kind, at any age, especially when ice cream was such a rare treat. Anyway, so even when I was little, it was sort of the same, but by the time I came along I probably got to pick my own flavor! Secondly, I don't like fruit. I just couldn't imagine the ruination of perfectly good ice cream and hot fudge sauce, with all that.......FRUIT! These cupcakes however, perfection. 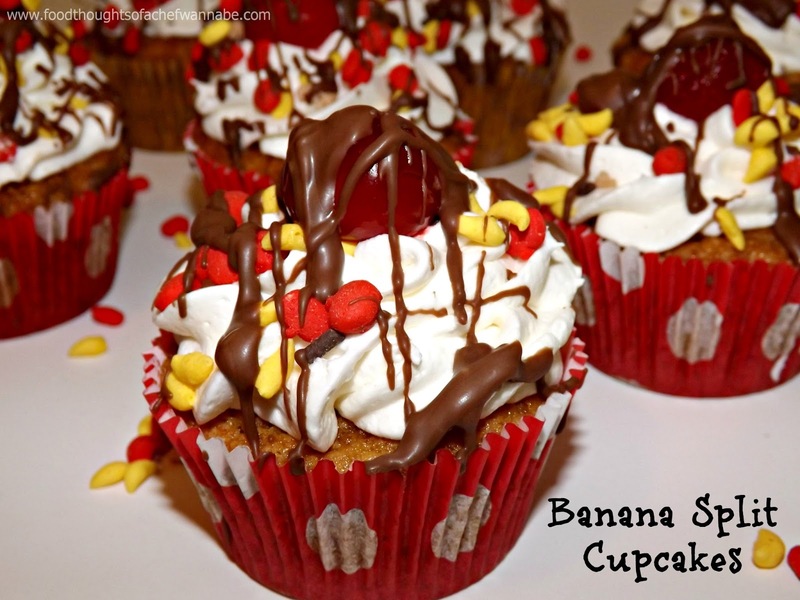 A little bit of a dense-ish banana cupcake, pineapple frosting, sprinkles, chocolate and a cherry. I mean, get outta here. The pineapple flavor is very subtle. You can choose to add some crushed pineapple that is VERY well drained or just use the juice. (hubs wants actual pineapple added next time) No matter what, these look like you labored hours in the kitchen and the reality is, they are so quick and easy. This recipe makes 12 cupcakes and the frosting will perfectly frost all 12! It is cupcake season, birthdays, school treats, school bake sales, parties, you name it. These will be a hit no matter WHO you serve them too! Here we go! Cake recipe first! Preheat oven to 350 degrees F. Mix all ingredients together in a bowl. Fill 12 liners in a cupcake pan with the mixture. Bake 13-15 minutes, remove from oven and let cool in the pan. Mix all ingredients. I piped mine on but feel free to use a knife or however you frost cupcakes! When the cupcakes cool, then frost. Add sprinkles while icing is still fresh and make sure to top with a cherry at this time! Let sit in the fridge or on the counter for 1 hour then drizzle with chocolate! Hello beautiful friends! I am in a good mood, can you tell? If I tell you why, you won't believe it. I have just made the most amazing marinara, EVER. Yes, I said EVER. Just look at this beautiful goodness! This may look like your everyday, run of the mill sauce, but trust me, it isn't! I was watching a blogger friend who also has a YouTube channel. Her name is Heather, of "Mishmawshandotherthings", and you can find her at her blog, or here at her youtube channel. I was inspired by her homemade marinara. I took her method, and some of her ingredients and added a few things of my own. This recipe looked fantastic and roasting the veggies before cooking them is fantastic. What flavor!!!! I have to thank her for being an inspiration for this recipe. I hope you go join up with her, she is a good lady, a real mom, with real kids, and she cooks real food. GOOD food. I am planning on making a large batch or multiple batches of this sauce to can or freeze. I am adding no meat, (as Heather did), and can see using this for a soup base, lasagna, for stuffed peppers, cabbage rolls, gravy, I mean the list goes on and on! Oh it was ROCK over meatloaf! When you want to add meat, you treat it as you would any other sauce, dare I say "jarred". Add your browned meat, meatballs, sausages, whatever you want. This is a versatile baby and I think you will love it! Preheat your oven to 350. Prepare all of your ingredients. When you have them ready to roast, put them on your sheet pan, drizzle with olive oil and salt liberally. Roast for 1 hour. Remove and let cool for 5 minutes. Put all roasted goodness into your blender. Blend on high until smooth. If you do not have a powerful blender you can strain it through a fine mesh strainer, mine left a FEW pieces of skin but I left them. If I had blended longer they likely would have been completely pulverized! I added about 5 large basil leaves to mine before I blended as well! Add back into your saucepan and add sugar to taste. I added 2 tbsp. I also added salt and pepper to taste. Simmer uncovered for 30 minutes. 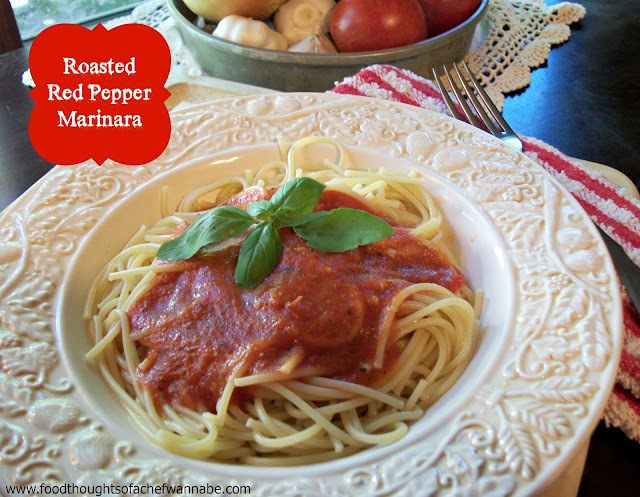 This is absolutely the most delicious marinara I have ever made or tasted I think. As you can see I simply added it to some plain spaghetti and just enjoyed the goodness! Crisp, clean, fresh and homemade goodness. You may never by jarred sauce again, I know I won't, not even in an emergency!